For many, it was a period of financial turmoil as banks failed, stock markets tumbled and millions lost their jobs. However, billionaire Warren Buffett kept on doing what he does best and began investing in a handful of blue-chip companies during the financial crisis. Five years on and the value of those deals are clear for all to see, America’s second richest man earning another $10 billion thanks to his choice investments. The fall of 2008, when the market was shaky and confidence was low, a number of stocks of companies that had decent reputations, were at record lows including Wells Fargo & Co. and American Express Co.
‘You make your best buys when people are overwhelmingly fearful,’ Mr Buffet said. 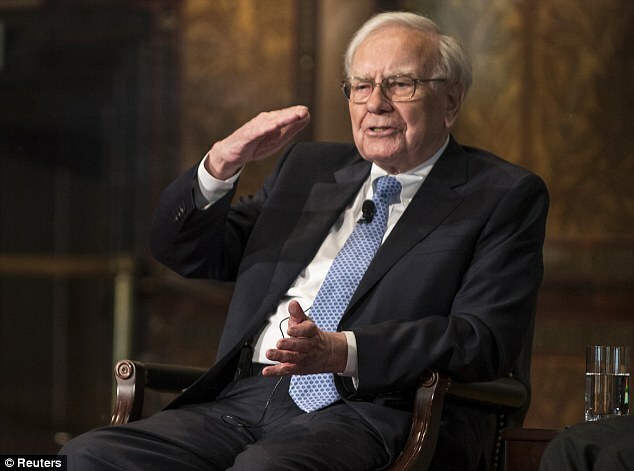 ‘In terms of simple profitability, an average investor could have done just as well investing in the stock market if they bought during the panic period,’ Mr. Buffett said in an interview to the Wall Street Journal, but few investors, if any, were able to navigate the choppy financial waters quite as expertly. By comparison, the U.S. government invested about $420 billion through its Troubled Asset Relief Program. The government also demanded beneficial terms and collected sizable dividend payments for a return of about $50 billion, or 12%, thus far, according to the U.S. Treasury’s website. 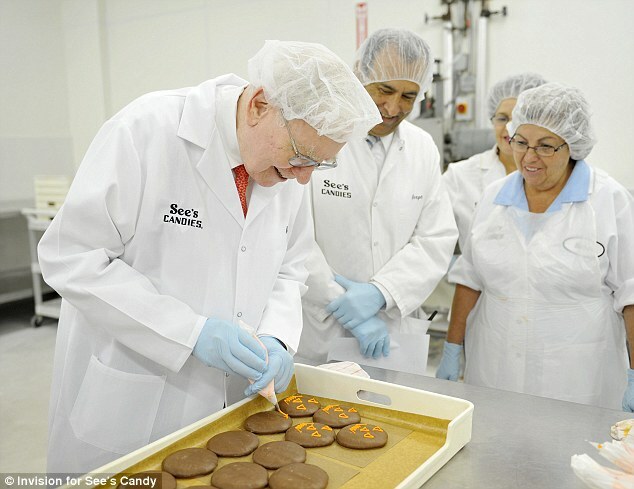 The latest windfall for the Omaha, Nebraska billionaire and his conglomerate, Berkshire Hathaway Inc., came when candy maker Mars Inc. repaid $4.4 billion that its subsidiary, Wrigley, borrowed in 2008. That payment alone is expected to net Berkshire a profit of at least $680 million. Mr. Buffett said he hopes to use the cash to make other big investments soon that will bring equally attractive returns. 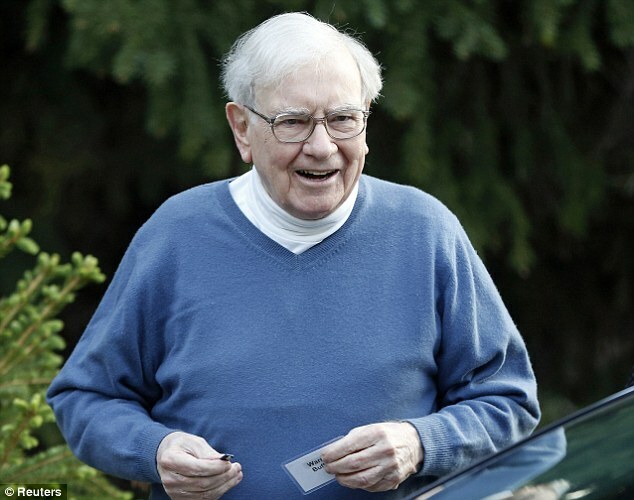 Berkshire will continue to buy stocks to add to its portfolio of over $100 billion, because ‘it’s still better to have equities than cash,’ he said. It all began with Mars in April of 2008, when credit markets began to tighten their belts, however, what meant even more to companies that were craving much-needed capital was Mr Buffet. However In addition to much-needed capital, the companies acquired something equally valuable: Mr. Buffett’s implicit endorsement of their long-term prospects. Call the midas touch if you will – shares of these companies generally went up after they revealed Berkshire’s involvement. In six major deals, Berkshire invested a total of about $26 billion. 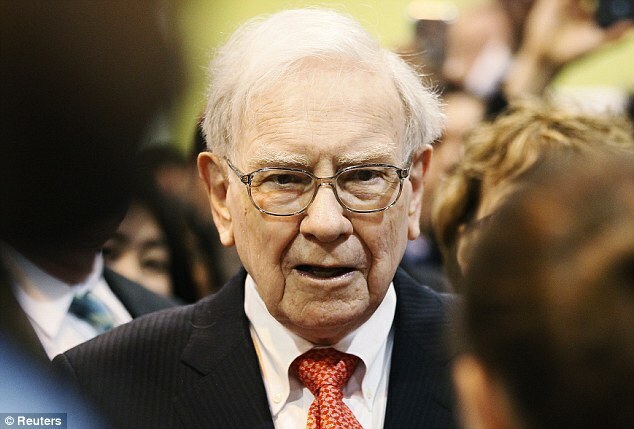 Mr. Buffett used Berkshire’s gigantic cash hoard to move swiftly and exact lucrative terms that created a stream of payments from the borrowers. Mr. Buffett’s deal-making started in the early days of the crisis and continued deep into the recovery. The last of the deals was a 2011 loan to Bank of America Corp. for $5 billion. Besides Mars and Bank of America, Berkshire made investments in Goldman Sachs Group Inc., Swiss Re Ltd., Dow Chemical Co., and General Electric Co.
Several deals are continuing to pay hefty dividends. As the economy has recovered, and with credit available at more attractive rates, some of the companies have opted to redeem securities owned by Berkshire or adjust the terms in ways favorable to Mr. Buffett. For example, Berkshire became one of Goldman’s largest shareholders with a $2.1 billion stake after the close of a five-year deal in which Berkshire injected $5 billion into the bank. The deal required the bank to pay $500 million in annual dividends. When Goldman redeemed the shares in March 2011, it paid Berkshire an extra $500 million as a premium. Berkshire helped Mars finance its $23 billion purchase of Wrigley. 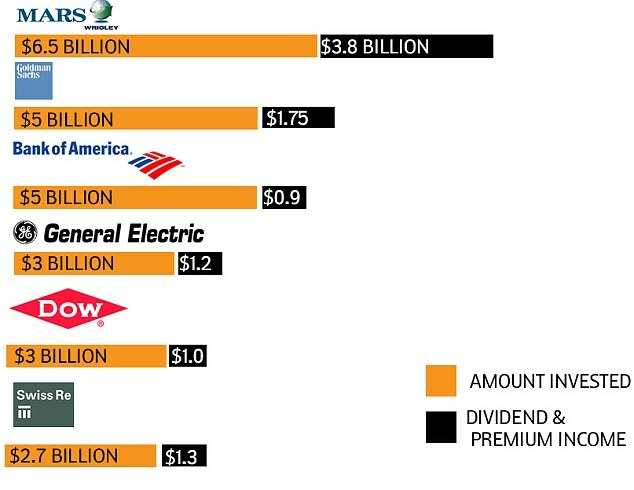 Berkshire contributed $6.5 billion, including $2.1 billion for preferred stock in Wrigley that pays an annual dividend. Berkshire also bought an additional $1 billion of Wrigley debt later. Tthe investment is expected to net Berkshire nearly $4 billion, including annual dividends and a prepayment premium since the bonds were due in 2018. In another display of Mr Buffett’s ingenuity, Berkshire invested $5 billion in Bank of America which adds about $300 million in annual pretax income. The deal allowed Buffet to purchase another 700 million shares for an additional $5 billion at $7.14 a share. Given the bank’s current stock price at about $14, it would create a further profit of $5 billion. When it comes to affairs of government Mr Buffett doesn’t believe holding congress to ransom is the way to pass legislation. ‘It makes absolutely no sense for politicians to use the debt ceiling as a threat to get their way on other legislation. It ought to be banned as a weapon. It should be like nuclear bombs, basically too horrible to use,’ he said in an interview with Fortune. If Congress doesn’t increase the country’s borrowing power by October 17, the government won’t have enough money to pay its bills, according to Treasury Secretary Jack Lew. Defaulting on the nation’s debt could trigger a global financial meltdown. ‘We will go right up to the point of extreme idiocy, but we won’t cross it,’ the Oracle of Omaha said last week.